We always try and give people as much freedom as they want on our holidays, but in many countries we have to draw the line at self drive, whether that's due to the roads, the available vehicles, the other drivers, or a combination of all three! Happily in Patagonia we have no such worries and we think our self drive holidays in Chile and Argentina are a great way to explore this beautiful part of the world. Your self drive holidays in Chile will begin this morning as you touch down in Santiago, and we will be there to meet you and take you straight to your hotel in the upmarket Providencia area of the city. You will then have the rest of the day free to relax and enjoy one of South America’s most sophisticated capital cities. If you’d prefer to book a guided tour for today such as a tour by bicycle or even on foot then just let us know! 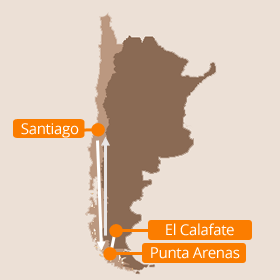 Alternatively you could take a trip to the Maipo Valley wine region? Another option would be a full day tour to the colourful port city of Valparaiso and Viña del Mar. Just ask us for more information! Our standard price is based on a Europcar I3 tariff (Toyota Hilux or similar) but if you'd like more room or power, just ask us about the full range of vehicles available. If you don’t think two nights gives you enough time in Torres del Paine then just let us know and we can add in an extra day to give you more time to explore and hike the trails around the National Park. Keen hikers may want to consider adding on an extra couple of days to drive up to El Chaltén and Mount Fitz Roy. This is some of the best hiking in all of Patagonia, and the photo opportunities are just incredible! Chileans are justifiably proud of their wines, and any holiday in Chile is enhanced by a trip out to some of the country's vineyards for a tasting session. We'd suggest a day trip into the fabulous Maipo valley, where you can visit a couple of Chile's best vineyards to sample their wares, as well as enjoying the beautiful countryside. The Atacama desert is the driest place on earth, and also one of the strangest. This four-day extension to our self drive holidays in Chile will take you out deep into the Atacama desert to experience the other-worldly landscape of giant red volcanoes, coloured mineral lakes, and wildlife including chinchillas and pink flamingoes! If you'd like to extend your self drive holidays in Chile to explore some of the country's most lovely natural scenery, easily accessible in a day trip from Santiago, why not take a trip into the gorgeous La Campana National Park? Ideal for walking and trekking, with paths that are accessible all year round, you can enjoy seeing waterfalls and palm trees, wildcats, skunks, eagles and chinchillas before driving back to Santiago in the evening. The port city of Valparaiso was once one of the most famous in South America, and before the opening of the Panama Canal it was a regular stop for all shipping as they circumnavigated South America. Today you can see its superb historic architecture and the brightly-painted hillside houses, reached by Victorian funicular railways. From Valparaiso we'll travel on to the beachside town of Viña del Mar to enjoy its lovely promenade and parks. Our standard price for these self drive holidays in Chile and Argentina is £1795 per person, which is based on two sharing a double or twin room in our standard hotels. That price includes all your accommodation, rental car with unlimited free mileage and local taxes (excluding the local airport pickup tax which unfortunately we are unable to pre-pay), self drive information pack, all transfers in Santiago, and breakfast every day.